I can't believe it's day 18 of #CraftAdvent2015 already! Not much longer to go now, but I still have some great guests lined up with some fantastic festive treats to share so stick around! Over the last few days I shared some pictures of the angel costumes I made for Lile and Sábha's first ever nativity show and of Lile and Sábha wearing said costumes. The pictures got lots of lovely 'likes' and, although no one asked for a tutorial, and all of the nativity shows are probably done and dusted at this stage, I'm going to stick one up anyway for future reference. So there. I hadn't actually planned on putting together a tutorial for this, as I sort of just winged it (pardon the pun!) and didn't take any photos as I went along, but it was so simple I decided a step-by-step doodle-guide would be a clear enough way to demonstrate. Fold the pillowcase in half, length-ways and cut along the lines demonstrated to create a neck hole and arm holes. Glue the tinsel around the openings, working slowly to make sure it's even and that the two sides don't accidentally stick together (that didn't happen to me, I swear...) While you've got the glue gun going, you can also stick down the 'flappy' bit inside the pillowcase to stop it hanging down. Tie the elastic around the waist of your child. Make sure it can still stretch enough to be pulled on/off. Fold the net curtain in half and cut in strips about 2-inches wide. Or thereabouts, they don't need to be perfect. (Next, put on the TV to help keep the child standing in one position while you -) Thread each strip under the elastic and tie a knot in the middle. Aim for the strips to meet the hem of the pillowcase 'dress' but accuracy is not essential. If they're too long, they can be trimmed later. If they're too short... they're too short... it'll still look cute. Keep going until the skirt is full. Use some leftover tinsel to tie into a halo. I got some shop-bought wings (they were too cheap and cheerful to resist!) 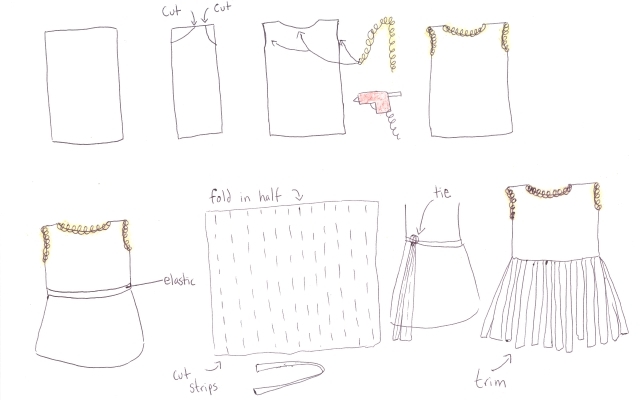 but if you'd like to go all-out crafty, THIS was the tutorial I was originally going to try. That is very clever! And always good to blog instructions like this..... for your own future reference if nothing else! Thanks so much! And that's exactly why I've recorded it - I have a TERRIBLE memory!